In mid-November I had to call the plumber. The toilet in the basement had been slow for months. The waste would flush down, but the TP would not, and the same bits would float around in the iron-tinged water for days. So I didn't use it unless I absolutely had to. But then the toilet upstairs got plugged. And the stopper lever kept coming off its chain. So the plumber came, but by then, the upstairs john had cleared itself. He fiddled around with the chain, though, and it worked again. The basement stool was another matter. He put the snake down, and couldn't find a thing that could be blocking it. But it was undoubtedly blocked. "I've got awful hard water here," I mentioned. "Do you think it could be calcium deposits plugging it up?" He took a probe and checked the holes where the water jets are supposed to squirt out around around the rim of the bowl. "Yes," he agreed, "these are full of lime." He dug around a little more, but to little effect. "The real problem is this inlet at the bottom of the bowl. And I don't have a tool that'll clear the calcium out ofthere. And I don't know if there's a chemical that's safe for you to try." "How about white vinegar?" I suggested. "You could try it. If it wrecks the stool, you're no worse off than you are now." And he took the minimum service fee for the call under my home warranty plan, and went away. Well, I tried the vinegar. Four gallons of it, in the tank and the bowl, for two or three days. And it worked! I still can't get over how gratifying it is to see that water swirl around and take everything down in my basement potty. Well, let's be civilized and say only that no, one does not insist on putting old socks and whole boxes of Kleenex and half the contents of the cats' litterbox down the stool and expect it to flush. Not at all. But there are certain things any competent water closet should accommodate, and mine, from time to time, emphatically does not. So this afternoon, I use it, flush it, and put down the lid. I've washed and am about to leave the room when I hear "Guh-loomp! Guh-loomp!" I turn around. My tabby kitten is lying on the lid. Oh, no, is he about to be sick? But no. The noise is coming from farther down, from the bottom of the toilet bowl. I shoo the cat off, open the lid, and see almost no water in the bowl. I flush the toilet. Water pours in, nothing goes down. I give it a few jabs with the plunger and flush it again. Four-alarm red-alert MISTAKE!!!! The water flooded in and didn't go down and here came the potty water, up, up, up and over the rim and down onto the floor! And it wasn't clean water, either. I turn off the valve to stop the deluge, then start to work again with the plunger. Of course, that splashes more water out onto the floor. I try easing it in at first, but soon discover that unless you push a good big bubble of air in with it, the plunger just won't work. So I did what had to be done, and got the stool unstopped. About then I noticed that oh! looks like there isn't as much water on the floor as I'd thought! Having fetched a couple old bathtowels from the basement, I wiped up the spilled water. And while I was at it, I cleaned the iron stains out of the toilet bowl. And got the vacuum cleaner out and sucked up the cat-hair bunnies from behind the sink and around the water dish and then got a clean towel and washed the rest of the bathroom floor. Lovely! How nice to have a clean bathroom floor going into the new year, regardless of why I had to do it! But then I went downstairs to get the clothes basket to put the dirty towels in. And in the kitchen I hear a funny noise: Dripp! dripp! dripp! Oh, damn, that stupid toilet water went down those bloody bad joints between the wall tile and the floor vinyl, and it was dripping through the joint in the kitchen ceiling sheetrock! Worse, it was coming down the walls and making big water bubbles of the paint! Same damn thing happened last time the upstairs john overflowed, about three and a half years ago, before I got the kitchen repainted. But now it is repainted and oh, no, don't I have enough on my 2008 house To Do list without adding "Touch up kitchen ceiling and wall paint"? Not to mention "Put a big honking bead of tub caulk around the base of the upstairs bathroom walls, you idiot!" Which I bloody well should have done after the first time it flooded. Could be worse, I guess. The ceiling joint's in a handy place to relieve the pressure, and it is sheetrock, so I don't have to worry about falling plaster. And the textured finish I have on the walls should keep the water bubble places (which I poked with a needle to drain them) from being too glaringly apparent until I can get around to repainting them. But still. This was not part of the 2008 plan! Guess that's part of the joy of home ownership. And several gallons of white vinegar is definitely on my list for my next Costco run. The upstairs can would benefit from two or three days of the 3% acid treatment. I mean, if it's not calcium deposits that's clogging it up, what could it be? A Dream, or a Financial Nightmare? I got a call this morning from the repairman at the local family-owned appliance dealer's. It'll cost me almost $200 to replace the wonky thermostat in my oven. Maybe more. That is, if anyone can sell them a thermostat for a going-on-eleven-year-old stove. If they can't get the part, I get to buy a new stove. Sorry, I mean, I'll have to buy a new stove. I admit it: I'd really like the excuse to buy this Frigidaire. You know, the one with the cool (or should I say, hot) convection oven converter feature and the regular, medium, and high-powered burners, the big honking oven window, and all the other bells and whistles. I've been on-line researching prices on the models I saw there, as well as dropping round in person to my local Lowe's, Sear's, and Home Depot. And the price at the family-owned shop is the best going, especially factoring in free delivery, set-up, and haul-away. But I have no business buying a new stove. I'm still not working full time and my income is drastically limited. Even paying to get the one I have fixed ain't exactly in the budget. If it's a junker, I really ought to be sensible and get an ultra-cheap pedestrian model with manual oven cleaning and knobs that turn things on and off and that's it. That's what I ought to do. But I don't wanna. If I do that, I'll be in conscience stuck with the thing for the next ten years. Or until I sell the house, whichever comes first. And how is anyone going to be thrilled with my kitchen if it's got only a boring basic range? So that would justify my buying the model I want, right? Well, I guess I'll see if the part is available for the eld beast. And make a common-sense decision from that. Last Saturday, a circular arrived from the local family-owned appliance store. It announced their "One & Only WINTER Clearance Event!" with "Our BIGGEST Savings of the Year!" Not only that, but I could also enter their Scratch 'n Match contest to see if I had won one of three prizes, the top one being a $10,000 kitchen makeover!! Well, I don't need that. My kitchen is one of the most pulled-together rooms of my very un-pulled-together house. But I scratched the silver stuff off the number dot anyway. Did not say "Sorry, You Have Not Won." There was a number there, all right. But the winning numbers weren't on the circular. Oh. Guess you have to ask about it at the store. And I needed to stop by there anyway. Because last week when I was about to launch into my big Christmas cookie baking campaign, my oven went haywire. I'd set it for 350, it'd stay there long enough to do one batch, but then the temperature would start to climb. 400, 500, 600 and on and on! Burnt cookies! Smoke alarms going off on every floor! General annoyance and frustration! 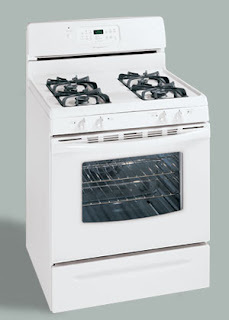 If one of their guys couldn't fix my oven, maybe this One & Only WINTER Clearance Event! could give me a line on a replacement stove. And I guessed I'd best do it quickly, since according to the circular, "WINTER" ends on January 1st. So I walked into the appliance dealer's this afternoon, again thinking how it'd be "just my luck" to win the kitchen makeover, when the room that really needs it is the bathroom. But I was really there to look at stoves. And I did. The only one that really fits my specifications is about $150 more than I'd like to spend right now. And the model with the feature that could really get me excited about spending the money (convention oven conversion at the flip of a switch--whoo-whoo!) runs an additional $100 more. And neither of these appeared to be part of the One & Only WINTER Clearance Event! Hmm. I think I'll bring the info on my existing cranky stove in and see if they can simply fix the overheating problem. Their repairmen should be familiar with the beast, since my previous owners bought it there and this shop has been out to fix things on it before. I was headed out the door when I remembered to ask the salesman, "Oh, yeah. How does this contest work?" He took me back to the service desk, where they had the winning numbers posted. And what the hell, if all my numbers didn't match for one of the prizes. A "3 Day/2 Night Vacation Getaway." Oh. That's nice. I actually won something. Oh! "Something" being hotel accommodations for two at any one of quite a wide range of destinations, as close as just up the road, so to speak, or as far away as Honolulu, Hawaii. I was aware of not being as excited as I might be. Maybe I wanted to stay cool so I could understand all the fine print on the redemption certificate. Maybe I wanted to keep my expectations down as to the quality of the hotels in question. Maybe I was feeling inadequate for not being married and having an automatic other half of the "for two" to take up the other side of the deal. Yes, well. I do like travel. And I do have girlfriends who'd enjoy going off on a larking kind of trip like this. And a good handful of the listed destinations were within driving distance. So this evening I got ahold of my friend Frieda*, and we're going to visit Colonial Williamsburg sometime next spring, about the time we both celebrate our birthdays. But as I was driving away from the appliance dealers, I found myself thinking, "Well, dammit. If I had the luck to win one of the prizes, why couldn't it have been the $10,000 kitchen makeover? I could have done a lot of good in the way of new appliances and a decent floor and countertops and some new lighting with that kind of dough, even if the cabinets and my adorable faux finish paint job are just fine. Why couldn't my luck just pushed me a little way further over? Answer me that, hmm?" But instead, I had to win a lousy free hotel accommodation certificate. Sheesh. The other prize was one of three iPhones. Well, I console myself, I don't want to switch over to AT&T anyway. Yeah, but I could have sold the thing on eBay and made some cash! Shut up, kid, and be grateful! You and Frieda* are going to go to Williamsburg in the spring and you're going to look at antique buildings and pretty gardens and you're going to enjoy it all very, very much! So there. And stop being a sore winner!